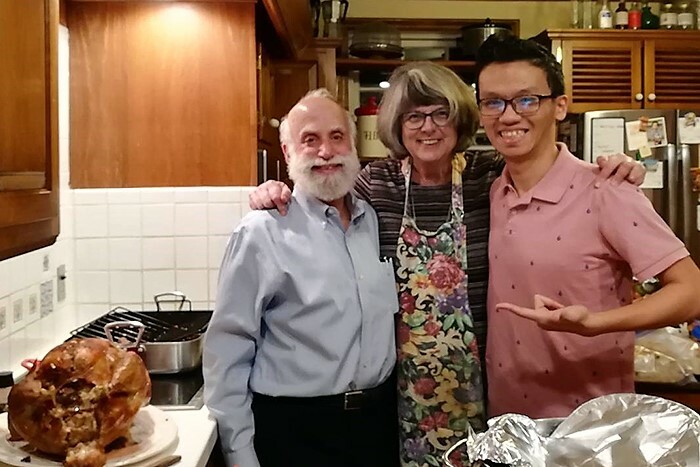 Trung Nguyen '19 and his Friendship Family as they prepare their Thanksgiving meal. Photo courtesy of Trung Nguyen. Traveling from the fast-paced streets of London to small-town Carlisle was not easy for Natasha Di Centa ’21 (undeclared) when she chose to attend Dickinson—7,200 miles away from home. And though adjusting to college life was challenging, she found something that made her transition to college more welcoming: Dickinson’s Friendship Family Program. Established in 2014, the Friendship Family Program meaningfully connects first-year students to members of the Dickinson and Carlisle communities. The program is geared toward international residents and domestic students who live more than 500 miles from campus. After students and potential hosts submit an application, the program staff pairs those who seem like a good match. “This year, we were especially lucky because we were able to attract more host families from the Carlisle community, while also attracting employees of the college,” says Assistant Dean of Student Leadership and New Student Programs Josh Eisenberg, noting that there are currently 46 friendship families. Throughout the academic year, the Division of Student Life sponsors events for hosts and students, which range from dessert receptions and cultural pot-luck dinners to gatherings at campus events and meals in the Dining Hall. Beyond these activities, it is up to the pair to determine how often they meet up. In the past, hosts and students have attended professional and college athletics events, celebrated religious holidays and embarked on adventures in and outside of Carlisle.